1Radio.FM showcase some of the newest indie bands, artists & DIY musicians from all over the world & many genres from rock, pop, alternative, r&b, soul, rap, hip-hop, country, meltal and more. help suport these artists by listening to there songs & visiting there websites, which can be found on 1RadioFM’s Bands / Artists Page. 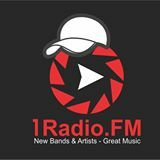 Dont forget to tune into1radio.FM regularly we have new songs & artists added daily, If your an original artists or in an original band send us your songs (visit our Submit Songs page for more info). Dont forget to promote 1Radio.FM on Myspace, Facebook, Twitter etc & Tell All Your Friends to Tune in. Not in a Band or Musician?. Want 15 Seconds of FAME!!! just record your own voice recording of yourself plugging1Radio.FM. eg. “I’m Bob, from London & Your Listening to1Radio.fm” or something like that. Be crazy, be funny, say hi to your friends, say hi to your Mum. Just Make sure to mention 1Radio.FM email your MP3 or Wav Audio file to [email protected] and we will give you your 15 Seconds of Fame. Check Out the 1Radio.FM Store for some great Merchandise!! !